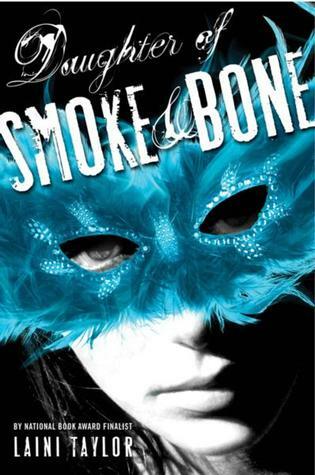 I’ve had several conversations in the past few months about Laini Taylor’s Daughter of Smoke and Bone. I’ve heard friends rave about the writing, but also furrow their eyebrows and scratch their heads when it came to the plot. It was enough to pique my interest. I had friends who loved it and friends who were incredibly frustrated by it, so of course I had to see for myself. Plus I’m always up for some well-crafted fantasy. Meet Karou. She fills her sketchbooks with monsters that may or may not be real; she’s prone to disappearing on mysterious “errands”; she speaks many languages not all of them human; and her bright blue hair actually grows out of her head that color. Who is she? That is the question that haunts her, and she’s about to find out. First off, Laini Taylor’s writing is gooooooorgeous. There are many authors who write beautifully, and I admire them greatly, but hers is possibly the most vivid and flowing prose I have ever read. The only problem with it is that it was so lovely and lyrical that it kept putting me to sleep. I need to emphasize, this is not because the story was dull. It’s because it was the reading equivalent of listening to soothing music, and once you throw in a bed or a recliner or a sunny day…I didn’t stand a chance. It was the strangest experience. I’ve never had that happen before with a book I actually found interesting. Normally, books that put me to sleep are boring. This one wasn’t. Just soothing. I should probably have read it in a straight-backed chair with a cup of coffee, but that’s no fun. Her world building is also fantastic. Every setting, from the streets of Prague to the otherworldy homes of the seraphim and chimaera, is fully realized and tangible. She painted detailed word pictures that really brought the environments and characters to life. In reading this book, I felt like I was getting a master class in setting and description. It’s amazing. The characters are varied. Karou is great, brimming with personality and quirks and feistiness. Especially in the first half of the book, before the history really comes into play, she is so much fun to read. Her conversations with her best friend, as well as the tiny wish-pranks she pulls on those who cross her, were some of the highlights of the book for me. Once her story merges with Akiva’s, she looses a bit of the vivaciousness that I enjoyed about her, but never falls flat. As for Akiva, he left me wanting a bit. I understand why he is the way he is — a warrior who has trained himself to suppress his emotions, empathy, and gentler instincts for the sake of survival — but this granite persona didn’t seem to me to be a natural complement to Karou’s fierce vitality. Their relationship, especially at first, didn’t seem to be based on a whole lot more than his stunning attractiveness. It just left me wondering if there could be a lot more to life than being really, really, ridiculously good-looking*. He’s not unpleasant, he’s just a little flat. For me to buy their deep ties to each other, I wanted a bit more from him. I hope it happens in the sequel. As for the plot, I can see where some people had difficulty. The book really changes tone about 2/3 of the way through. Not only does it change from more lighthearted and occasionally witty to dark and epic, but it shifts focus from Karou’s quest to learn what’s happened as a result of the black handprints, to Akiva’s story of events that happened before Karou was even born. The back story becomes the plot, and the result is that essentially nothing happens in the “present” for the last third of the book. You just learn why the things that have happened, happened. Now I really can’t tell you how to feel about this. For me, it was a little dissatisfying to realize that the present plot — Karou’s plot — was not going to move forward before the book ended. But at the same time, all the history that is revealed is imaginative and fascinating, so while I wished there was more plot progression, I enjoyed everything I learned. I absolutely plan on reading the sequel, and look forward to finding out what happens to Karou and Akiva now that all the history has been revealed. I also hope that several enjoyable characters from the beginning of the book who disappeared in the latter half are able to make a reappearance. If you’re a person who really needs to know what is going to happen, and not only why it’s all happening, this book may not work for you. But if you think you will enjoy a book that is primarily character exploration, world building, and back story — so essentially, set-up for the sequel — then this book is beautifully executed and I highly recommend it. This entry was posted in Fantasy, Review, Young Adult and tagged daughter of smoke and bone, laini taylor. Bookmark the permalink. This has been on my TBR list for a while now, just haven’t gotten to it yet. Great review!